Self-help books get a bad rap - some people think they’re too preachy, unrealistic, and clichéd. While many of them are, you can find some gems in the rough if you look hard enough. In 2018, I dipped my toes into the world of non-fiction, and now I’m kinda hooked. So, I’ve made a list of ten non-fiction reads to inspire you! 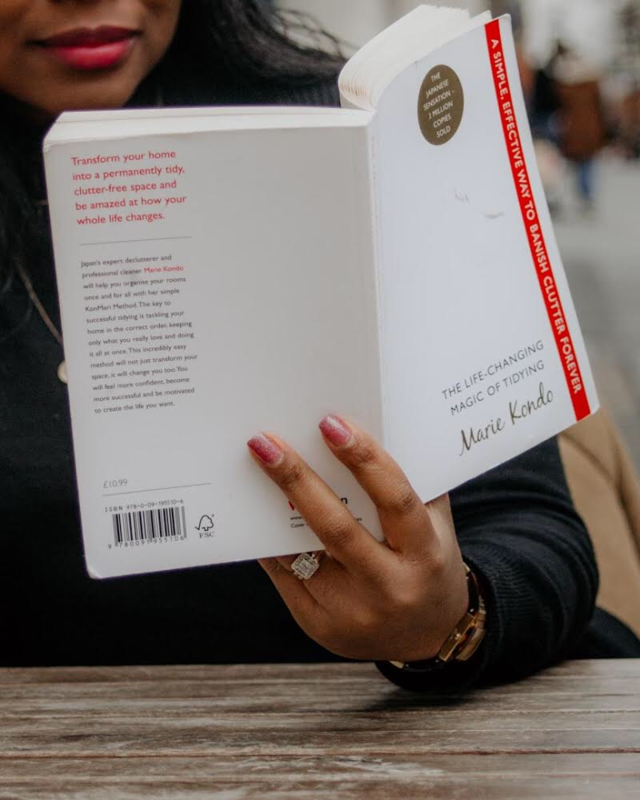 These books are either memoirs, self-help, or essay collections that will make you want to become a better person, chase your dreams, or just feed your body better. Read if: You’re on the hunt for life advice. After finding Havrilesky’s “Ask Polly” column a couple of years ago, I was thrilled to find that she’d written a book too! How to Be a Person in the World is a collection of original, impassioned, and inspiring letters. She gives answers to questions such as whether persons should quit their day job to follow their dreams, how to rein in an overbearing mother, and whether or not to put off having a baby for a career. I read this one and enjoyed it. Years later, I still remember some of her advice from time to time. Read if: You struggle with being or feeling awkward. Ever said goodbye to someone, only to discover that you're both walking in the same direction? Or had your next thought fly out of your brain in the middle of a presentation? Or accidentally liked an old photo on someone's Instagram or Facebook, thus revealing yourself to be a creepy social media stalker? Melissa Dahl’s Cringeworthy dissects the compelling psychology of awkwardness, and asks: what if the moments that make us feel most awkward are actually valuable? This one is on my radar, because I am awkward and awkward is me. Read if: You’d like to get your focus back in a world of distractions. Several people have recommended this book to me and it has excellent reviews on Goodreads. “Deep work is the ability to focus without distraction on a cognitively demanding task. It's a skill that allows you to quickly master complicated information and produce better results in less time. Deep work will make you better at what you do and provide the sense of true fulfillment that comes from craftsmanship. In short, deep work is like a super power in our increasingly competitive twenty-first century economy. And yet, most people have lost the ability to go deep-spending their days instead in a frantic blur of email and social media, not even realizing there's a better way. Read if: You’d like to improve your relationship skills. As someone eternally fascinated by love and relationships, this book caught my eye. Author, Richo offers a fresh perspective on love and relationships—one that focuses not on finding an ideal mate, but on becoming a more loving and realistic person. How to Be an Adult in Relationships explores five hallmarks of mindful loving and how they play a key role in our relationships throughout life: attention, acceptance, appreciation, affection, and allowing love and life to be what they are without trying to take control. Read if: You’re looking for more efficient ways to do everything. Atul Gawande is a surgeon and writer whose books I’ve heard tons about since medical school. This book focuses on the merits and demerits of the simple checklist, using stories from around the world. We live in a world of great and increasing complexity, where even the most expert professionals struggle to master the tasks they face. Longer training, ever more advanced technologies‚neither seems to prevent grievous errors. Acclaimed surgeon and writer Atul Gawande finds a remedy in the humblest and simplest of techniques: the checklist. Read if: You can’t get enough of life advice. Although the podcast is no longer running, Cheryl Strayed’s Tiny Beautiful Things was wonderful while it lasted. Thankfully, there’s a book full of her sage advice. Tiny Beautiful Things brings the best of Dear Sugar in one place and includes never-before-published columns and a new introduction by Steve Almond. Rich with humor, insight, compassion—and absolute honesty—this book is a balm for everything life throws our way. Read if: You want to build better habits in life and work. This is another popular non-fiction book that people have recommended over and over. I consider myself a true creature of habit, so you can understand why this is on my list. In The Power of Habit, award-winning New York Times business reporter Charles Duhigg takes us to the thrilling edge of scientific discoveries that explain why habits exist and how they can be changed. With penetrating intelligence and an ability to distill vast amounts of information into engrossing narratives, Duhigg brings to life a whole new understanding of human nature and its potential for transformation. Along the way we learn why some people and companies struggle to change, despite years of trying, while others seem to remake themselves overnight. Read if: You’re ready to take control of your life, set goals, and make money. In this refreshingly entertaining how-to guide, #1 New York Times Bestselling Author and world-traveling success coach, Jen Sincero, serves up 27 bite-sized chapters full of hilariously inspiring stories, sage advice, easy exercises, and the occasional swear word. If you're ready to make some serious changes around here, You Are a Badass will help you: Identify and change the self-sabotaging beliefs and behaviors that stop you from getting what you want, blast past your fears so you can take big exciting risks, figure out how to make some damn money already, learn to love yourself and others, set big goals and reach them - it will basically show you how to create a life you totally love, and how to create it now. Read if: You’re an entrepreneur looking for an inspiring memoir. While I’m not a Nike head, this memoir has been making the rounds and I’m curious to see what the fuss is about. Nike founder and CEO Phil Knight shares the inside story of the company’s early days as an intrepid start-up and its evolution into one of the world’s most iconic, game-changing, and profitable brands. In 1962, fresh out of business school, Phil Knight borrowed $50 from his father and created a company with a simple mission: import high-quality, low-cost athletic shoes from Japan. Selling the shoes from the trunk of his lime green Plymouth Valiant, Knight grossed $8,000 his first year. Today, Nike’s annual sales top $30 billion. Read if: You’re a foodie curious about eating what your body needs. I follow author Laura Thomas on Instagram, and I loved this post about veganism. She’s a nutritionist with a PhD who knows her onions, so I’m excited to read this. Just Eat It isn’t just a book. It’s part of a movement to help us take back control over our bodies. To free us from restrictive dieting, disordered eating and punishing exercise. To reject the guilt and anxiety associated with eating and, ultimately, to help us feel good about ourselves. There you have ‘em! I have to admit, self-help is pretty much hit and miss for me, but I’m looking forward to reading Deep Work and The Checklist Manifesto sometime this year. Do you enjoy personal and professional development books? Which ones are your favorite? I’d love to know and check them out. 5 Thrillers to Keep You on the Edge of Your Seats!